So here's a story for you. I have a friend named Melissa who has a friend named Tara. They live in Pittsburgh. I met Tara once while I was visiting Melissa...during the last weekend of Jake Watch no less. We all went to a grand Halloween party or two and I got low-to-mid-level drunk and was hit on repeatedly by a guy who thought I'd be "perfect" as a cage dancer and then later I ensnared the event photographer just by *existing* and tried to ignore him as he stealthily took several dozen photographs of me and so enamored was he that months later he was still bringing me up to Melissa, all of which was OH MY GOD SO CREEPY. I have not been back to Pittsburgh since. But Jake, who probably never gets told he should be a cage dancer, is there right now filming a movie, which I know absolutely nothing about, except that maybe Anne Hathaway is in it. Or maybe that's another movie. WHATEVER. It just so happens that Jake, who is *obviously* stalking me via my friends, is now living in their neighborhood. Should I visit? No. Because why get his hopes up like that? At 7:58 PM CST last Wednesday night, I received the following information from Melissa: "Tara is, even as I type this, eating dinner 6 feet away from Jake Gyllenhaal. I have probably taken you to eat at [some eating-place]; it's the [insert-nationality-here] restaurant right above it, in which I have never stepped foot. I am, of course, in...Florida, because I am a terrible stalker and went off-mission. But rest assured, he is there, consuming ethnic cuisine." The following morning, sometime CST, Tara confirmed: "He was! It's also, like, Pittsburgh's tiniest restaurant. It seats maybe 25 people." HA HA. Jake. Just thinking about him in a tiny restaurant makes me laugh. For no reason. He was there with Hank Azaria. Apparently. Tara reported to Melissa that he's "SO HOT." Tara sees Jake again, on the sidewalk outside of some other restaurant. "I once made a list, for a JW post that was never published, of all the things Jake did. There were only four things on it and going to the grocery store was one of them. He also walked on sidewalks and went into and out of airports. I can't remember what the fourth thing was, but I think it's safe to say it didn't involve bars of any variety. I think if you stick to sidewalks and the produce aisle, an encounter is inevitable." So see? I know Jake incredibly well, on account of my knowledge of his love of sidewalks. I had originally planned this post to contain one long story about Jake eating dinner, but that, my friends, is only the tip of the iceberg! I just keep getting e-mails about restaurants and sidewalks and "he walks a dog in the mornings (could it be the long-lost Boo, or is there a second Gyllen-canine?!)" Answer: It's totally Atticus (I guess)! And how funny that just today I was editing the "I don't have my puggle" part of my epic Jake Watch book. So the short of all this is...I will be back with more Jake info when I have it and YOU'RE WELCOME. I just got off the phone with Melissa. Melissa was wandering about this entire day with her camera in hand. The G-20 starts tomorrow in Pittsburgh and what with all the politicians and the movies being filmed, the Pitt is pretty much the center of the universe right now. Melissa didn't see anyone while she was walking about with her camera...but tonight, the one time she left her apartment WITHOUT her camera, she ran into Jake. "I'm looking at him right now!" she said, as I shouted into the phone, "Go talk to him! Get his autograph! Why the hell do you not have a camera?!" Jake, who was standing around smiling, signing autographs, and taking pictures with people, jumped into a van not long after. Melissa didn't have any autograph material with her anyway, but as a commanding officer of the Jake Watch fleet, I ordered her to keep a Sharpie and something sign-able in her purse from now until Jake leaves the city. 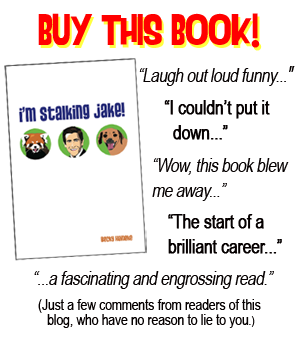 I also recommended that she never leave home without her "I'm Stalking Jake!" button and then congratulated her on achieving full agent status. I'm sure she'll run into him again because he's filming in her neighborhood at the moment. Some party scene at some house, I'm told. "He looks really good," she said. 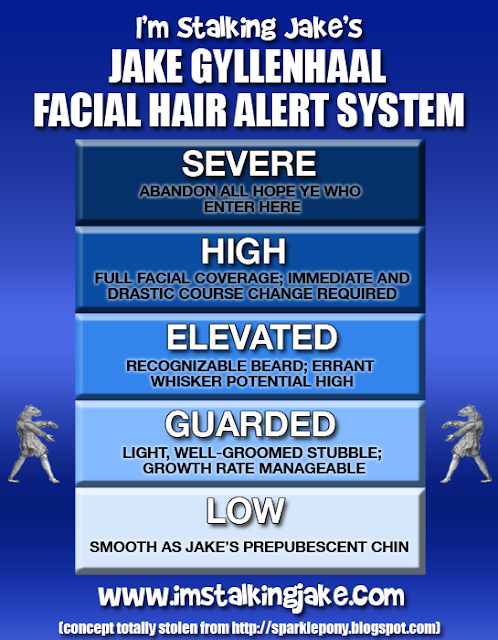 "He's all clean-shaven." ...but the question I'm asking myself today is...is it really my attention he's trying to catch? Melissa: Just saw him show up for work. Got a terrible, blurry pic. He was taking pics with bystanders! Becky: [expletive deleted] I want to see the picture anyway. Damn. Good job!!! Are you going to stick around in case he comes back out?? Melissa: We're gonna walk back by in a minute. My timing is hilariously on point. I'm not waiting around at all. Um, I'm sorry, not waiting? As in "waiting" with a "not" in front of it? As in, not standing around for hours on end? That kind of not waiting? I'm not familiar with this concept. A skeptic might (MIGHT) come to the conclusion that Jake is trying to make this easy for Melissa... Maybe it's secretly MELISSA that Jake is obsessed with (!!!!!) !!!!! MEANWHILE, here is Melissa's picture of Jake, which she insists that I precede with the disclaimer that it's awful and she hates it and is ashamed of it. But we don't care, right? 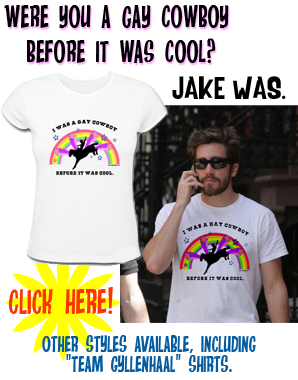 Because it's so totally Jake! She adds: "I think he was throwing a mock tantrum because everyone else under the tent was laughing." Thanks to Leslie for the link to the article!! OMG, you have done it once again PG & made my day! I'm sitting here reading this & LMAO instead of taking my poor new laptop to an IT to get the nastiest f***ing trojan out of it I have ever dealt with. Thank goodness for back up PC's! I loved this, so inspiring to us new stalkers. Let me clarify that, have been a Jake fan for 8 years, but new to stalking since PoP got a hold of me & NOW I'm a slave to The Gyllenhaal. I have taken excellent notes! HA! There IS hope for me after all!!! >;-) THANK YOU, PG! Hello all! I'm a new Gyllenhaal stalker. Let me just say that Prophecy Girl is my hero...She has Jake G's adoration and attention. *sigh* What I wouldn't give to be her. She did such a good job for us Im Stalking Jakers... i still remember the excitement of that era... and i was still half a world away! Its nice to read it all again! Is it sad or impressive that we can make Jake out of a blur of colors? Like even if I'd seen that picture randomly somewhere else, I would probably still automatically assume Jake. The closet encounter I've ever had to Jake was that I once flew over Pittsburgh during the time he was filming LaOD. I CAN'T FATHOM HOW YOUR FRIEND WAS ABLE TO STAND IN SUCH CLOSE PROXIMITY WITHOUT SOME SORT OF SIDE EFFECT. It it makes me lulz even more when Jake is clearly the most clear thing in the picture. His presence blurs the surrounding environment. I am L.M.A.O. Hilarious! So...why are you NOT at the airport catching the first plane out of Memphis right now? That's so awesome, I'm thinking of going to Pittsburgh, and I don't know one person who lives there! Not ONE. Clearly, between creepy dude and Jake (is there any difference?) you are stalking material. OH! Prophecy Girl is from Memphis? Me too! Now, I'm convinced that I was fated to become a Gyllenhaal stalker with you as my Yoda. *bows dramatically* LOL! LOL, Call Me Mo! 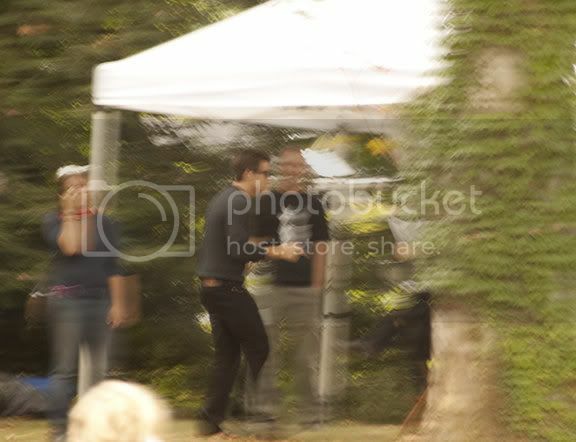 I'm sure everyone in my RL would disagree but I think it's very impressive that we can identify Jake in that picture. It's a skill you absolutely need as a ISJ agent. Wow, I really AM out of it! You're pulling me back in, tho....not that I'm complaining! LOL!